I can’t believe the proposal actually happened! I’m still floating on cloud nine… even though it has been weeks since he asked. As soon as I became a fiancée, I knew immediately who I wanted by my side on our special day. All I needed next was the perfect way to ask them. 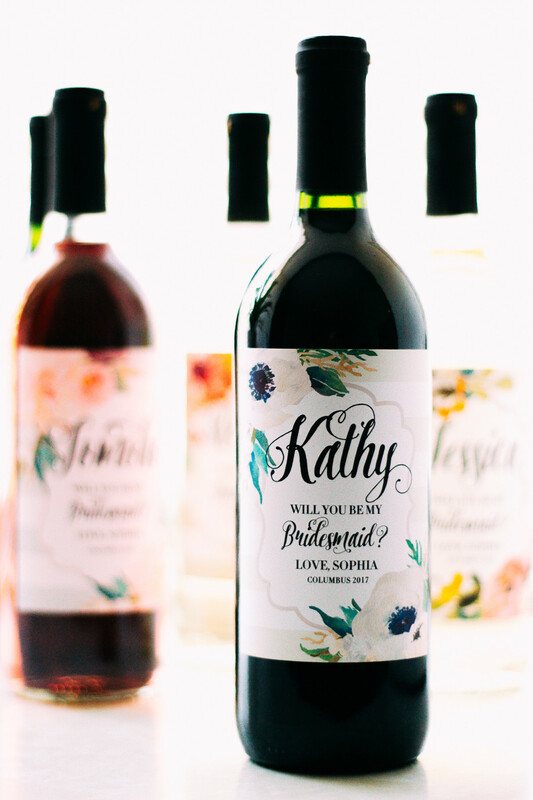 I stumbled upon JOIE Labels on Etsy and fell in love with their gorgeous wine labels. Best part about them? Completely customizable. Every detail was tailored to my liking! 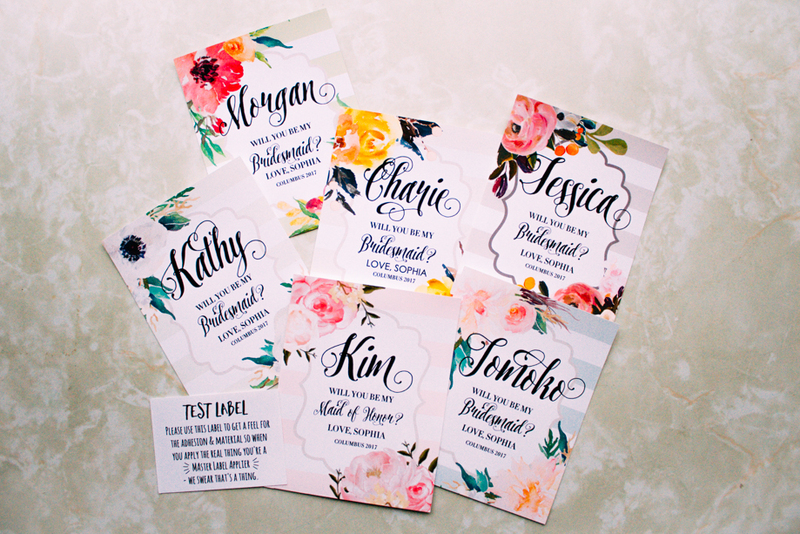 The fonts, borders, text, and floral bouquet were all hand selected (with my keyboard of course). 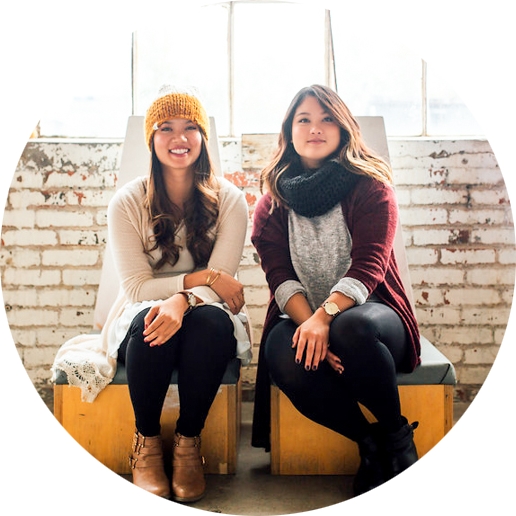 Owner and graphic designer of JOIE Labels, Pria, helped me every step of the way. The turnaround time for digital proofs was crazy fast and their customer service was nothing short of perfect. It only took two days to finalize the labels. To make each wine special, I chose 6 different wines depending on each person’s palate. With a variety of sweet and light to full bodied reds, I was able to accommodate every tastebud. 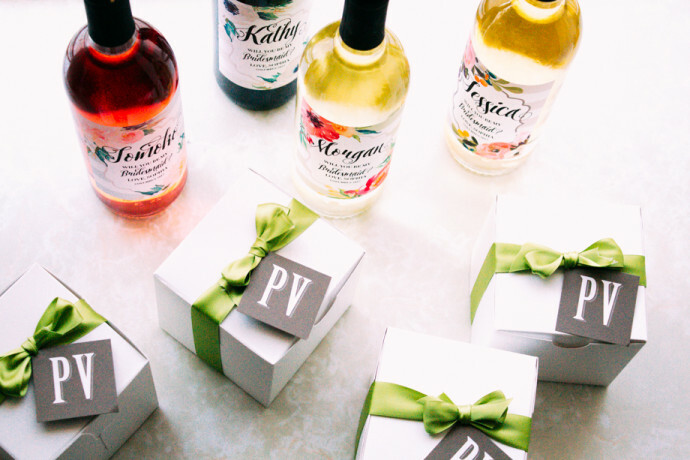 For bridesmaids who don’t drink, I grabbed wines that were great for cooking! 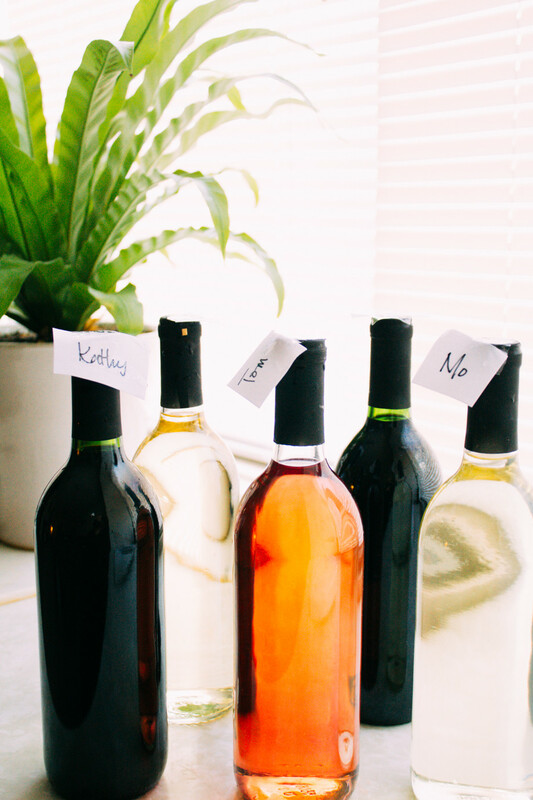 Once the wines were chosen and purchased, it was time to prep the bottles. Before removing the labels, I made sure to mark the bottles with names. This allowed me to keep track of whose bottle was whose once the labels were gone. The labels were easy to apply and it just took some patience and practice to get it down! 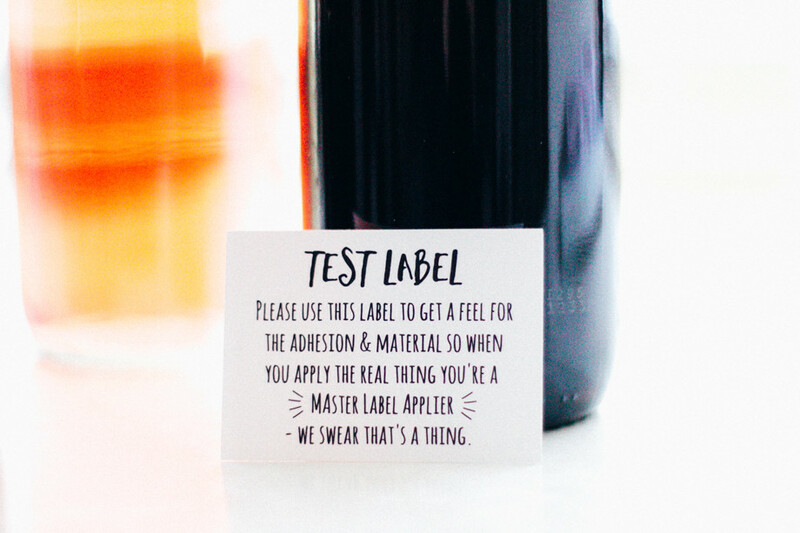 Applying it slowly was the trick in avoiding air bubbles behind the label. With a slow and steady application, I smoothed the bubbles out and the labels looked more than perfect. 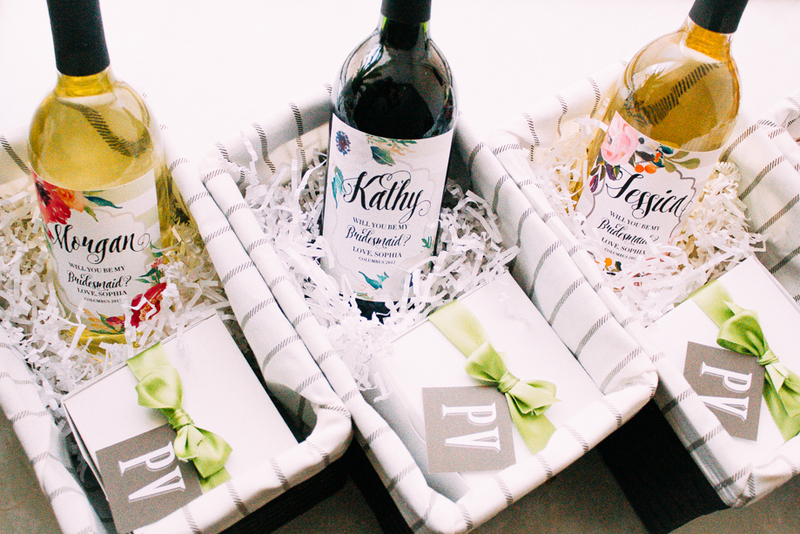 With cute $5 baskets from Target and a box full of Pistacia Vera goodies, these beautiful bottles were ready for delivery! Can’t wait to order more JOIE Labels for future bridal events. Next up… mini champagne bottle labels! I like your hand-made bottle labels! You’re so creative! Cooking and creating with you is a real pleasure and enjoyment!